You’re not imagining it. That extrovert who seems so different from you? It’s because his brain is different. 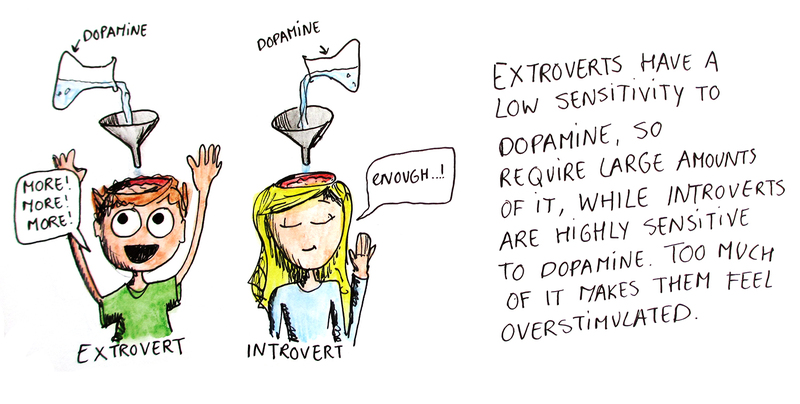 Why do extroverts like action, but introverts like calm? It has to do with two powerful chemicals found in our brains — dopamine and acetylcholine, “jolt juices” that hugely impact our behavior. 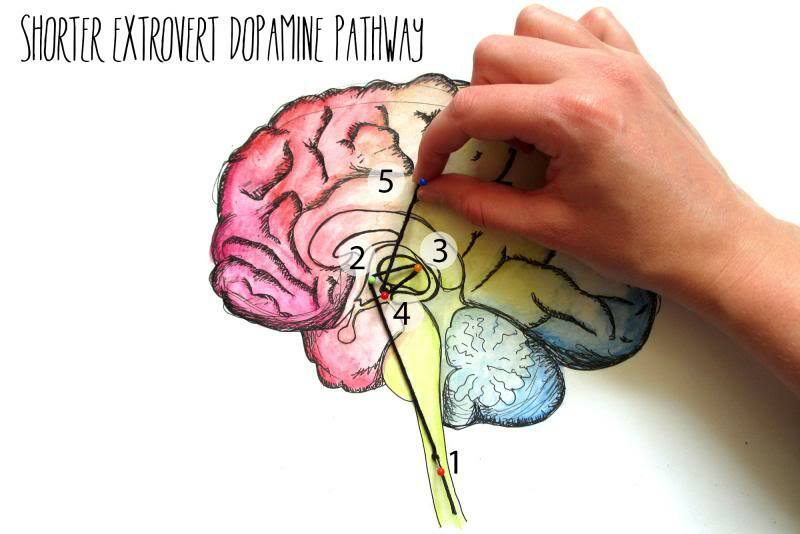 Dopamine gives us immediate, intense zaps of happiness when we act quickly, take risks, and seek novelty. Acetylcholine, on the other hand, also rewards us, but its effects are more subtle — it makes us feel relaxed, alert, and content. However, when we read, concentrate, or use our minds in any way, we feel good because our brains release acetylcholine. 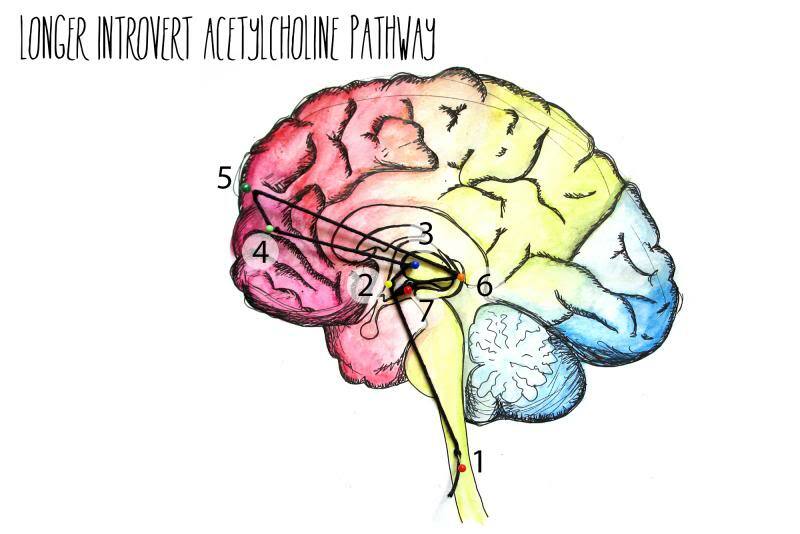 Extroverts, on the other hand, hardly register acetylcholine’s gentle happiness bump. Everyone’s nervous system has two sides — the sympathetic side, which triggers the “fight, fright, or flight” response, and the parasympathetic side, which is responsible for “rest and digest” mode. Think of the sympathetic side as hitting the gas pedal and the parasympathetic side as slamming on the brakes. When your sympathetic system is activated, your body gears up for action. Adrenaline is released, glucose energizes muscles, and oxygen increases. Areas of your brain that control thinking are turned off, although dopamine increases alertness in the back of your brain. But when you use the parasympathetic side, your muscles relax, energy is stored, and food is metabolized. Acetylcholine increases blood flow and alertness in the front of your brain. Of course, extroverts and introverts use both sides at different times. But which side do we introverts prefer? You’ve probably already guessed: according to Dr. Laney, the parasympathetic side, which slows us down and calms us. Ever wonder why, as an introvert, you overthink? It has to do with how we process stimuli in a different way than extroverts do. When information from the outside world — like someone’s voice or images on a computer screen — enters an extrovert’s brain, it travels a shorter pathway, passing through areas of the brain where taste, touch, sight, and sound are processed. The right front insular, which is an area associated with empathy, self-reflection, and emotional meaning. This is also the area of the brain that notices any errors. Broca’s area, which plans speech and activates self-talk. The right and left front lobes, which select, plan, and choose ideas or actions. These areas also develop expectations and evaluate outcomes. The left hippocampus, which stamps things as “personal” and stores long-term memories. This means we process information more thoroughly and deeply. No wonder it sometimes takes us longer to speak, react, or make decisions! A study published in the Journal of Neuroscience found that introverts had larger, thicker gray matter in their prefrontal cortex, which is the area of the brain that is associated with abstract thought and decision-making. Extroverts had thinner gray matter in that same area. This suggests that we devote more neural resources to abstract thought, while extroverts tend to live in the moment. 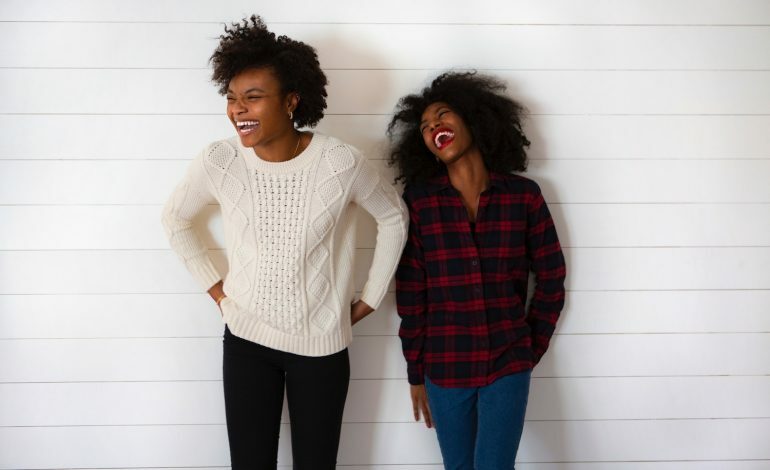 It means that as an introvert, you were probably born this way — although, of course, your background and experiences play a role in shaping you, too. It doesn’t mean that you’ll never enjoy a party or seek new experiences, or that an extrovert will never sit still and read a book — we still get to choose what we do. And of course, “introversion and extroversion are not black and white. No one is completely one way or another — we all must function at times on either side of the continuum,” Dr. Laney reminds us in her book, The Hidden Gifts of the Introverted Child. That extrovert? Give him a break. It’s his brain.